It is officially autumn where I live, and for me the absolute best time of year. I’m not a huge fan of summer, I’m not even sure why, it just kind of dogs me down. This past summer was a season of loss for our family too—we lost three family members, a couple of friends and one of our beloved cats. I am not sad to shut the door on summer any year, but this year I am really ready for it to be done. I was diagnosed with anemia too, which has made me see everything through a scrim of exhaustion for the last few months (it’s a temporary condition and I’m starting to pull out of that funk, I think). In part I love the fall because it’s such a porous season. It’s like a beautiful person approaching old age and you can see through the flesh to the beauty of the bones, to the very essence of them. The trees turn golden and crimson and yet you can see the winter there in the boughs, waiting. It’s a bittersweet feeling and all the more poignant for the knowledge that it is the most fleeting of seasons. Earth’s jeweller is hard at work this time of year- in the ruby of rowan berries and rose hips, the gold of birch leaves, in the pale silver mist rising from cooling ponds and streams and the strung diamonds of dewy spider webs. These are the most priceless of jewels, and they lend a richness to the heart which no ring or choker can match. This morning I was walking in the park that edges my neighbourhood. There’s a pond there where a few years ago I watched a flock of geese come in to land. I could actually feel the air swooshing past my ears as they used their wings to brake. It was one of those moments that freeze frame in your heart, and you can pull out to look at later when you most need it. The geese are gone already, though they seemed to abandon the pond partway through the summer. I count them each year and know that less and less of them return. It is one of those things I notice but wish I didn’t understand. I wonder at times, if there will come a year when there simply aren’t any. As I said, it’s a porous season and the reflections are not always happy ones. Creativity returns for me in the fall, I feel a surge and a tingle in my fingers and an absolute need to write. It’s as if the characters know it’s the thin time of year and so they come closer, speak a little louder and allow me to simply inhabit their world more fully. We can feel the touch of those who have departed in the fall. They too can come closer and linger, and we can feel them across the divide the way we can’t in other seasons. The Celts knew this, it was what Samhain was all about. Welcoming home the dead, and keeping council with them for a night. The year, to the ancient Celts, had two hinges and Samhain was the door to the dark half of it. They considered winter the season of ghosts and Samhain was the night those ghosts rose from the Underworld. On Samhain, time became meaningless and past, present and future were all one. As I listened to geese going overhead the other night, under the light of a full harvest moon, I thought of how the Irish once believed those lonely calls were that of the Wild Hunt, the cavalcade of fairies who came abroad on those nights to gather the spirits of the dead who were lost and roaming untethered by either hearth or family. I love that idea, that there is someone to gather the spirits of those departed from us, always too soon, no matter their years, it’s always too soon. This porous season is a time of harvest and reflection before the dark half the year sets in. Autumn is the season I wish I could breathe in so deeply that I could taste it in the depths of winter. It is the season of staying, of harvesting, of gathering in and turning toward spirit. And so I will listen to the ghosts who linger near, and hear what they have to say to me. After all, they are my own. I began with Rilke, and so I will end with him as well. The reaction to the newest book in the Exit Unicorns series- In the Country of Shadows- has been very gratifying. I’ve never had a book received with such enthusiasm and emotion. It has been lovely, and the fulfilment of some long ago dreams I had while writing little snatches of things at my kitchen table each afternoon when my girls were small. The idea of actually completing a novel was almost beyond me then, never mind four sizeable ones. So, of course, the inevitable question which always arises with a book readers love- when will the next one be done? This one is not quite two weeks in the world, mind you, but I think people new to the series may not realize that. When I tell people it takes four years for me to write one of these books, they tend to be a little aghast. So I thought I’d lay out a little of just why it takes me that long. I am a slow writer, I’ll just be honest about that. The books I write are dense, filled with detail, with stories inside of stories, history (which is as accurate as I can make it, I do my research both through books and on-line archives and through on-the-ground talks with people and interviews with those who have lived through the history I write about) and several on-going story lines which get- hopefully- richer but also more complex as time goes by. That complexity slows the process down, but I would rather keep the complexity and take longer, than sacrifice the depth of the overall story. The truth is I wouldn’t be happy with something less than the best I can do, and neither would the readers. My audience has grown a LOT since Flights of Angels came out four years ago, and so I felt I owed it to my readers to give them a release date for Shadows somewhere along the line. Because I’m an indie author I’d never had to do this before. I had always simply released the book when it was ready and let my fan-base know about it about two weeks beforehand. The deadline made me buckle down though, as I knew it would. I had to work really hard from August through to beginning of December simply to get Shadows done. This often meant I spent 12-16 hours at my desk each day, including weekends, in order to get the book done with enough time to spare for several rounds of edits and then handing it off on deadline to the formatting people at 52 Novels (who did a bang up job and are just all around terrific people to work with, in case you ever need formatting services). The production phase from completed manuscript to ‘real’ book was four months, and that is tight when you are dealing with all the details yourself. Every decision ultimately comes down to me- even though I do bounce everything off my husband first. Some days the writing flows really well, other days- well, other days I gaze out the window a lot and hope the muse shows up for at least a few decent sentences. For me, as a writer, the quality only comes with the time and space needed for the book to breathe and grow and become what it is meant to be. Writing is a very organic process for me and so each story unfolds in its own time—rather like a seed sprouting under the sun rather than being forced under a hothouse lamp. I usually try to make at least one trip to Ireland during the writing of each book. Being there always re-fills my creative well. 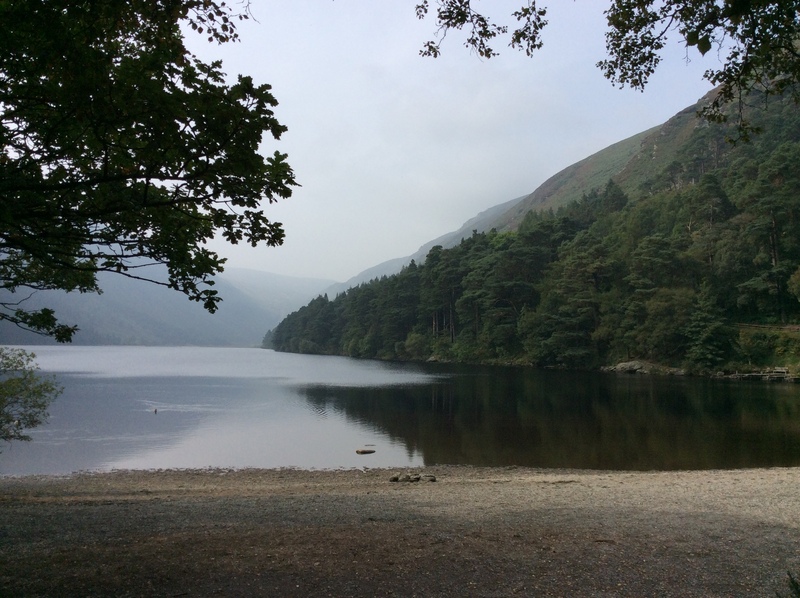 If you have read Shadows then you’ll know part seven of the book (which takes place in Wicklow) is a bit of a love song about the Irish countryside. I never would have been able to write that as I did, had I not written it while in Wicklow. There is something about Ireland that is magical, and I always feel like my writing is just that little bit better while I’m there. Last time I spent a month there and I hope to do the same during the writing of book five. Research is time consuming, but it adds the details that make the whole book come to life in a variety of ways. Even simple things like perusing dresses on Pinterest until I find one that is just right for Pamela to wear to a beautiful party in Paris, can take up a few hours. Or Gypsy caravans for instance-which as most of you know I have a bit of an obsession with- I like to know how they are built, how they are heated, and the practicalities of living in them every day. For the tarot card scene at the end of part three I did a reading myself, with a deck of cards that I find a little spooky, but which were the cards that ‘felt’ right for that scene. I did the reading and then wrote it out so that the reading Yevgena gives Pamela in that scene, was an actual reading. Writing that scene took several days, and that was without going back and filling in the details and fixing the mistakes. I did a lot of research on Native American culture for this book too. Most of what I read didn’t make it into the book, but I think the ‘ghost’ of it does infuse the book in the details that do make it and adds to the overall feeling and mood of the individual chapters in which Eddy appears. Which leads to the topic of secondary characters- they all come with their own histories and enough of their history has to be included so that they too become fully-fleshed people who live and breathe for the readers. My creativity tends to be cyclical with the seasons, which isn’t probably all that rare with writers or artists of any stripe. I produce better in late fall, winter and spring. Summer is a bit of a dead zone for me for some reason. I don’t do any of the things they tell you to do as an indie author- I don’t write several books a year, I don’t write short books that can be read in one sitting (well I suppose you could, technically, but I think your back might protest). I don’t write erotica or thrillers or romance. I realize this might mean I’ll never sell millions of copies of my books but I can’t write anything that doesn’t come from my heart—again this goes against the advice of what indies are meant to do, you’re supposed to approach writing as a business and conduct your career accordingly. However, I refuse to give less than one hundred percent to my writing and to these characters. I owe them and myself that much, and I feel I owe that to the readers too. If I ever ‘phone it in’ the readers will be the first to notice. I want to bring the same passion and commitment to each book, as it is one more section in the overall tapestry of the whole story of Pamela, Jamie, Casey, Patrick and company. And you know, I am pretty fond of them, and want to do them justice even when the things they do might make the readers want to smack them a little. And listening to them, and then crafting good sentences and captivating story lines from what they tell me, does take time. Also, I do like to respond to every letter or message I get from readers. For a long time I didn’t know whether I would ever find a sizeable audience. I have though, and I’m honestly grateful to each and every person who either took a chance on a complete unknown or who spreads the word about these books to their friends and family. It’s a pleasure for me to hear from readers because writing can be a fairly isolating profession, as I’m sure you can imagine. Also because it’s always nice to hear how my books have affected someone in their life, sometimes in ways that truly surprise and humble me. Then there’s just life- cleaning the house, doing laundry, walking the dogs, paying the bills, getting the flu occasionally, and when he’s lucky, presenting my husband with a home cooked meal. I come from a line of women who cleaned other people’s rooms and homes for a living, despite being some of the smartest, wittiest and funniest women you could hope to know. Not that there is any shame in that profession, it’s just that they wanted more from life but didn’t have the opportunity to do other things, but they in part made sure that I did. They are the ones that told me stories and gave me a love of reading that led to my being a writer. I credit them with my innate stubbornness that has kept me at this writing gig when everything in the universe seemed to be telling me it was time to give it up- I’ve never been good at taking no for an answer. I owe those women the best I can produce too, because I feel them at times, reading over my shoulder while I write. All that being said, I am working on the fifth book and I have a side project that I am also working on which I hope to release some time between books four and five- it fuels my creativity to have something else on the go besides the main project. I’ll let you know when to look for that. In the meantime there are re-reads and of course, lots of fantastic authors on the shelves of both book stores and libraries.